This book is a critical and comprehensive assessment of the ocean mining provisions of the United Nations sponsored Law of the Sea Treaty. 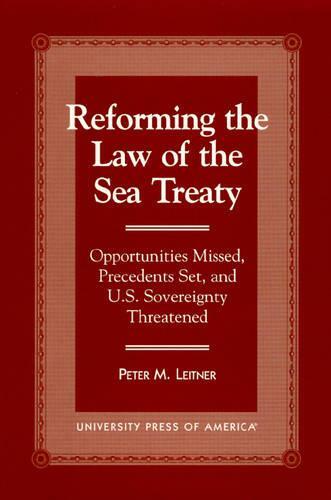 In its unique multidimensional approach, Peter M. Leitner places treaty issues in the context of larger U.S. national security/economic security concerns. This book discusses the origins of the treaty, its negotiation, the key events which led to its rejection by the Reagan administration, modifications achieved in 1993-4, the effectiveness of those changes, and the gains and losses for the United States if the Senate ratifies the treaty. It also takes a broad perspective concerning serious technology issues. Because the Clinton administration signed the treaty last summer, and in the near future it will be presented to the Senate for ratification consideration, this is a very timely book. This work will also inform readers of the technology-based national security aspects of the treaty debate and of several important negotiating milestones known only to long-time treaty insiders.